Hello Gravity is a band that wants to make people dance. Koch, along with his bandmates – brothers Mike Zitzelsberger (vocals, keys) and Thomas Zitzelsberger (bass), and drummer Simon Popp – possesses an almost quasicandid approach to making music, one which focuses on music for music’s sake. “I think authentic is a key word here,” the elder Zitzelsberger (Mike) said before a recent concert at Berlin’s Magnet Club, sharing how they play music that, first and foremost, makes them feel good. The origins of Hello Gravity date back to high school, when the four boys from Schrobenhausen – a town some 70 kilometers outside of Munich – began playing together at small local venues. Three-and-a-half years ago, the band played its first show in Munich, and later gave a copy of its music to musician and producer Ron Flieger, which eventually led to signing with independent label Dienje. “It’s like the normal, nobody-will-believe-it story, about how a band gets a record deal,” Koch explained. But landing a record deal was just the beginning, and then it was up to the band to keep working hard to gain and keep a following. “It kind of took a little longer to get people to know us,” Zitzelsberger said, referencing how a label backing doesn’t necessarily equate to a solid fan base. Particularly, because of the band’s Southern German headquarters, which is apparently over-saturated with bands, Koch explained that new acts have to be memorable, as they are, in essence, competing for the attention of audiences. One way the band stands out is through its use of English lyrics. Although it was never a conscious decision to do so, the band members agree that penning German words would not necessarily capture the attention of music fans in the way that English does. Additionally, regardless of whether they hail from tiny towns or large locales, most Germans grew up listening to English-speaking music. “When you live in a small suburb, you don’t have too many influences,” Koch said, citing mainstream media outlets like television and radio as the source of entertainment. “So for me…music, like pop music, was always English. 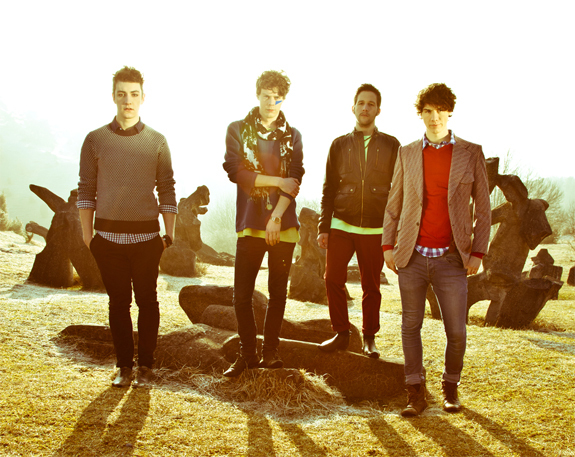 Hello Gravity released its debut album, “Wunderkind,” just six months ago, in August of 2011. The title is a nod to the many German words that have infiltrated the English language, something which Zitzelsberger said is important to acknowledge: particularly the close relationship between the two languages as it pertains to the band. Of course, it could also be a halfway tongue-in-cheek reference to themselves, a group of four young men who have already begun to make a name for themselves. The fellows in Hello Gravity certainly can’t and won’t be likened to Mozarts of their time, but what they have accomplished on their own is nothing short of admirable. This entry was posted in Interview and tagged Feature, German, Hello Gravity, Interview. Bookmark the permalink.